All Graphics Cards or Discrete Video Cards come with their own BIOS which contains all the important settings for graphics cards regarding fan speed, clock speed, voltages etc. Generally graphics cards do not require BIOS update unless you are facing some serious issues like unstability, freezing, compatibility issues or other technical issues related to GPU. Also if your graphics card is voltage-locked and you want increase the voltage of the card for overclocking purpose then you have to install a custom or modded BIOS on your graphics card. Graphics Card BIOS or GPU BIOS is also known as VBIOS, Video BIOS or VGA BIOS. Updating or Upgrading Graphics Card BIOS is not that hard but you should be very careful in updating VGA BIOS otherwise you might end up bricking your graphics card and render it useless. There are separate special tools available for both Nvidia and AMD graphics cards for GPU BIOS update. 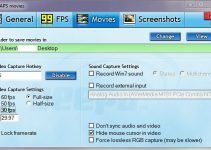 Here in this post I am going to list down the tools that you can use to update the video BIOS of your graphics card. Here the various reasons that may prompt you to update the VGA BIOS of your graphics card. Stability Issues – If you are facing stability issues like artifacts on screen or monitor, frequent freezing, BSOD, crashing or restarts due to graphics card then you can try and flash the VGA BIOS of your graphics card to solve these issues. Heating Issues – Sometimes a faulty or buggy GPU BIOS can cause unexpected heating of your graphics card even when the card is on stock frequencies. This is because the fan speed settings and temperature throttling settings might not be working properly on your current BIOS. In these circumstances you may try and update the GPU BIOS to fix these issues regarding overheating of your GPU. Overclocking Issues – Some graphics cards come with locked voltage and due to this you cannot increase their voltage for higher overclocking and stability. So to unlock the voltage you can flash your GPU BIOS with a custom or modded BIOS for higher overclocking and better stability. Locked Features / Options – To unlock some hidden features and options you can flash your VGA BIOS to get the extra benefits on some graphics cards. Here the best and top Nvidia BIOS Update tools for flashing your GPU BIOS. 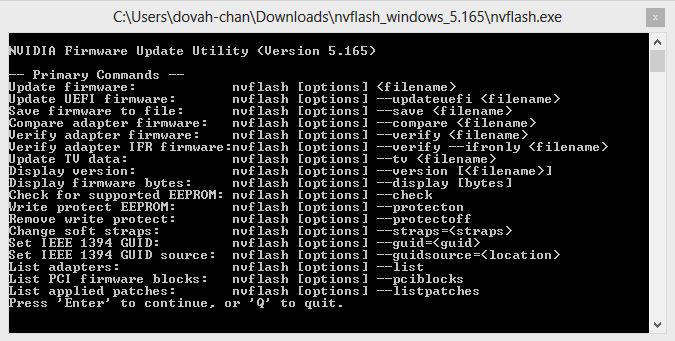 NVFlash is the best NVIDIA Firmware Update Utility for updating the BIOS of your Nvidia Graphics Card. Using this tool you can update your VBIOS and can also save the current VBIOS for backup purpose. This is a command line tool and you can flash multiple graphics card using this Nvidia GPU BIOS update utility. This tool support windows operating system and it can also be run from a bootable USB disk. 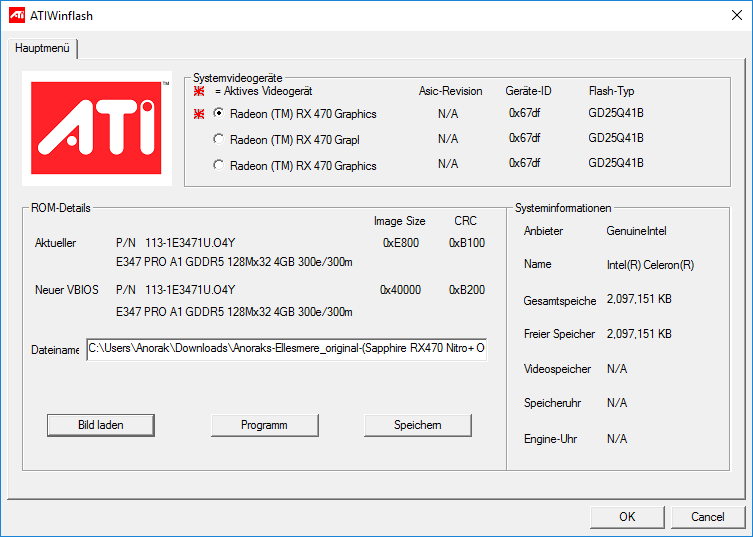 NiBiTor or NVIDIA BIOS Editor is a utility for editing the BIOS of your graphics card. 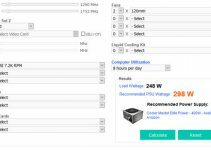 Using this VBIOS editing utility you can customize or make important changes to your VBIOS file regarding clock speeds, voltage, timings, boot settings, temperature settings and then can save the updated VBIOS to the hard drive for flashing purpose. Now after making the appropriate changes you can use NVFlash to flash your VBIOS using this new VBIOS file that you have saved with NiBiTor. 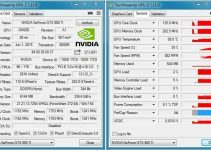 NiBiTor is indeed a very powerful and advanced for VBIOS modding or tuning utility for Nvidia graphics cards. 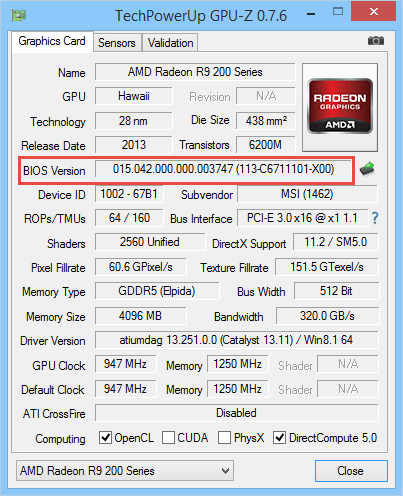 Here are the top AMD BIOS update tools to flash VBIOS of your AMD Radeon graphics cards. 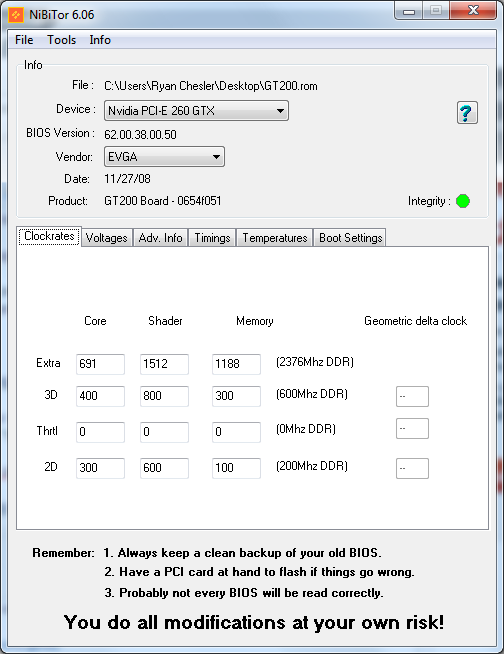 This is the best and safest tool for updating BIOS of your AMD graphics card. This AMD VBIOS update tool has both console / command line and GUI interface. You can use any one of them to update your AMD graphics card VBIOS. ATIFlash is previously known as ATIWinFlash but now it is renamed as ATIFlash only. This AMD VBIOS update tool can be run from windows and from bootable USB storage disk or drive. Just like NVFlash, you can backup your current VBIOS and update to newer one using ATIFlash BIOS update tool. If you are unable to find your graphics card BIOS on your graphics card manufacturer website then you can get it from the link given below which has the largest collection of VGA BIOS files for both AMD and Nvidia Graphics Cards. Here is simple and brief guide on how you can successfully update the BIOS of your Nvidia and AMD graphics card. The first step is to download the new BIOS for your graphics card. You can check your graphics card model and current VBIOS version using graphics card information tools like GPU-Z and then look for the correct BIOS on the graphics card manufacturer website or on other reliable website. After finding your GPU BIOS, save to your hard drive. The BIOS file generally has the .ROM extension to it. 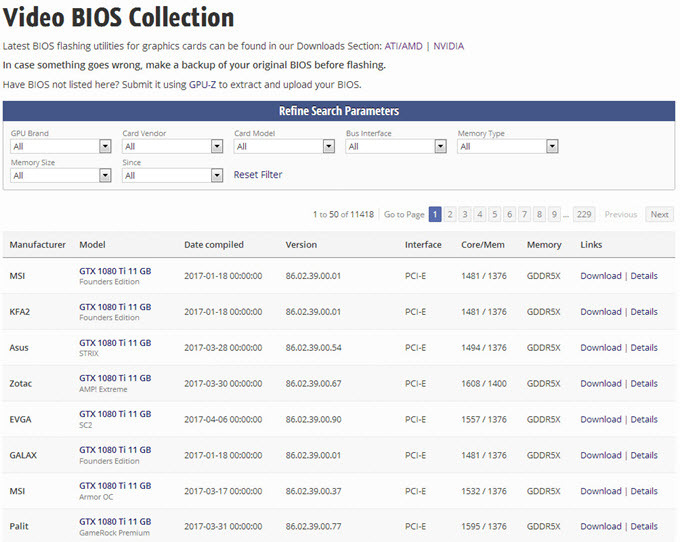 Now download the BIOS update tools for flashing your graphics card VBIOS. For Nvidia graphics card you have to download NVFlash and for AMD graphics card you have to download ATIFlash to update your VBIOS. Now make backup of your current VBIOS using these GPU BIOS Update tools because if anything goes wrong with the new VBIOS then you can safely roll back to your older VBIOS. You can also create backup of your current GPU BIOS using GPU-Z. After backing up your current BIOS you can now flash your BIOS to the newer one by executing the following commands. After successfully updating the BIOS or Firmware of your graphics card, you can test it by overclocking and by playing games to see if everything is working normally or not. If you encounter stability issues or unexpected rise in graphics card temperature then you should roll back to your older VBIOS that you have saved earlier in step 3. Updating graphics card BIOS or VBIOS is pretty easy and safe if you do it correctly. Generally graphics cards do not require BIOS update unless you are an advanced user or enthusiast who want something extra from the graphics card, or you are facing some serious issues with your graphics card. With right tools, VBIOS version and procedure you can update the VBIOS without any problems. If you still have any queries regarding GPU BIOS or VGA BIOS update then you can ask me that by leaving a comment below. I’ve been digging for way to flash the motherboard of a SAMSUNG NP275E4E PC. What tool supports firmware for these amd64 MB? Reason I wish to flash is I expect a rootkit has taken control of bios or a linux firmware-update went wrong along the way. The system only boots off an x32 bit ROM now even when the LONG_BIT is set to 64. Any help you can give me? These tools are for GPU and not for motherboard. I think you should ask Samsung support for this. Akshat thanks for your free advice. I was thinking it was a VBIOS issue because the screen is black/blank, and only error that shows is “amd64 microcode is not compatible with ATI.” Even booting incompatibility mode I couldn’t get a POST screen. I have talked to the manufacture “Samsung” doesn’t have bios tools to help with these new mircode update-issues. It’s a compatibility problem between the VBIOS and the CPU bios. The only work around I am aware of is to disable ucode checking during post or to turn off ucode checking by adding “dis_ucode_ldr,” to the GRUB post screen. It only disables checking and doesn’t really fix anything. The Debian developers promise better tools in the future to manage firmware compatibility rather than having ISO files install falutly microcode. I think you should make a request to HIS.